LANE, on being introduced to George Cruikshank, the above celebrated artist appeared much pleased with the etchings and designs shown to him; and he also complimented THEODORE on his abilities. Robert Cruikshank was equally liberal with his remarks; and both of these highly talented men were ever afterwards his friends. Grand entrance to bamboozl’em, published by George Humphrey, February 1821. Theodore Lane was one of the great ‘might-have-beens’ of early nineteenth-century English caricature. His first works as a caricaturist appeared amongst the frenzy of speculative publishing that erupted during the trial of Queen Caroline in 1820 and in the decade that followed he was to become one of the new generation of caricaturists that attempted to fill the void left by the passing of many of the individuals that had defined the genre’s ‘golden age’. Like many of his peers, he also harboured hopes of transcending the world of commercial publishing to become a serious artist and by the mid-1820s had begun working extensively in watercolours and experimenting with oils. By the spring of 1828 he had come tantalizingly close to realising this ambition, having had his work displayed in two well-received exhibitions at the Royal Academy, when his life was cut short by a tragic accident that occurred in May 1828. 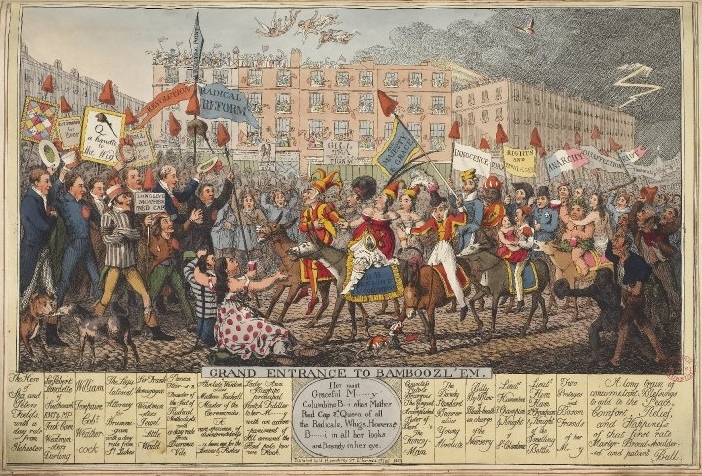 Had he lived, it is perfectly possible to imagine that his reputation as a comic artist and illustrator may well have grown to rival that of his great peers such the Cruikshank brothers, Robert Seymour and William Heath. The only contemporary account of Lane’s life comes from the brief biographical sketch of the artist that the journalist Peirce Egan included as an addendum to The Show Folks! (1831). Although what follows is largely derived from this text, it should be noted Egan actually provides us with very little detail about Lane’s work as a caricaturist (which in itself is perhaps an indication of the extent of the genre’s decline by the early 1830s) and at times appears to be guilty of embellishing his account in order to suit his own literary ends. I have therefore also had to rely on what little information we can derive from Lane’s caricatures and the various obituaries that appeared in the British press following his death, to flesh out this account of his short career. Theodore Lane was born in Isleworth in the county of Middlesex in 1800. Although Isleworth was swallowed by the suburban expansion of London in the late nineteenth-century, in Lane’s day it was still an affluent market town that sat some ten miles to the west of the capital on the banks of the Thames. Lane’s father had been a successful drawing master but was dogged by a succession of health problems that would eventually render him incapable of working. With the family’s finances becoming ever more precarious, young Theodore was plucked from his schooling at the age of 14 and enrolled as an apprentice to Mr John Barrow of Battle Bridge (then a north London suburb in the area later covered by King’s Cross Station). Egan describes Barrow as a “colourer of expensive prints” but in fact his business was far more sophisticated than this an encompassed miniature painting, engraving and publishing. The few surviving examples of Barrow’s work that are known to exist (left) suggest that Theodore Lane was taught his craft by someone who was both a skilled artist and an accomplished craftsman. It’s not clear exactly when Lane left Barrow’s to strike out on his own. The earliest prints to have been attributed him were published by George Humphrey in early December 1820 but Pierce Egan notes that the young artist had “scarcely finished his apprenticeship when the two men first met in 1822. Assuming Egan is correct, this means that Lane’s early works as caricaturist were either produced under Barrow’s direction (with the master being legally entitled to any pay Theodore would have received from Humphrey for his work), or that Lane was moonlighting for another publisher behind his master’s back. This latter theory may explain why his name does not seem to appear on any of the prints he produced prior to 1822 which have subsequently been attributed to him. Lane found continual employment with Humphrey from the winter of 1820 through to the spring of 1822. It seems likely that he was drafted in to replace George Cruikshank, who had been Humphrey’s preferred artist for most of the preceding decade but whose talents were now being monopolised by his work with Egan on Life in London. 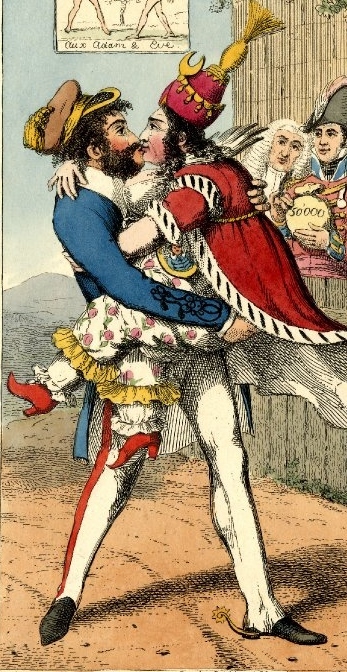 With Cruikshank otherwise engaged, Humphrey set Lane to work engraving a range of conservative political prints that reflected the public’s on-going interest in the royal divorce scandal of the previous summer. Lane rose to the task splendidly, producing at least 30 or 40 plates within his first six months. His designs typically reflect the prejudices of Humphrey’s upper class clientele, with jibes about the nature of the Queen Caroline’s relationship with her Italian secretary Bartolomeo Pergami, and the low social status of her followers being amongst the most consistent themes to his humour. 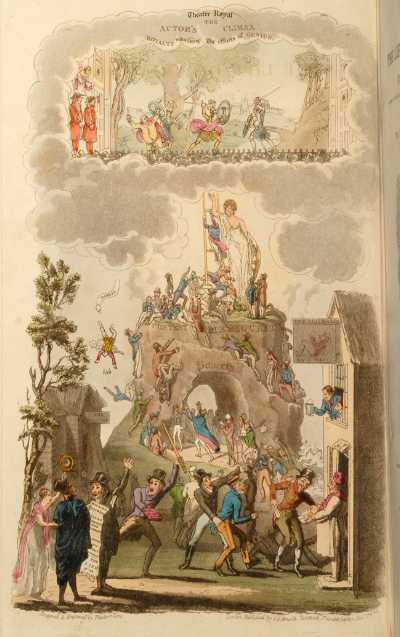 Prints such as Installation of a Knight Companion of the Bath (1821) and A Parting Hug at St Omer! (1821), Grand entrance to bamboozl’em (1821), The Mother Red-Cap Public House, in opposition to the King’s Head (1821) and Caroline Fair, or Mat Pudding and his Mountebank (1821) are all typical of the work Lane was turning out in this period and showcase both his comic inventiveness and his skill in rendering complex, detailed, designs on copper. The pace of production was such that Humphrey’s storeroom was also raided to provide inspiration for new prints and at least half a dozen of the plates Lane produced in this period were in fact skilled re-workings of earlier caricatures by James Gillray. These include; Delicious Dreams! (1821), Meditations at Brandyburgh; or and address to the Sun (1821), Dido in Despair (1821) and The Effusions of a Troubled Brain, or Evil communications corrupt good Manners (1821). The latter print, a rebooted version of Gillray’s Lieut Goverr Gall-Stone inspired by Alecto; – or The Birth of Minerva (1790), provides a particularly impressive example of Lane’s skill at wielding the engraver’s burrin. Despite this initial setback, Lane was eventually able to convince Egan to take on the project and in December 1824 he received a handsome stipend of £115, 15s. (equivalent to £24,000 today) from the publisher C.S. Arnold of Tavistock Street, Covent Garden, for the 27 engravings and 9 woodcuts he produced to illustrate the text. The Life of an Actor was published in January 1825 and marks a major transition in Lane’s style as an artist. 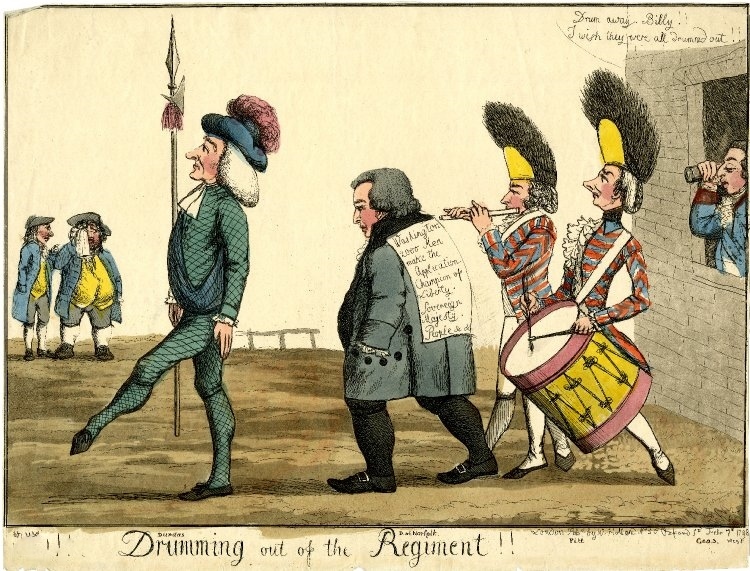 The heavily burlesqued style of many of his early caricatures is largely gone and has been replaced by a more muted, illustrative, mode of drawing which is often strikingly similar to that of George and Robert Cruikshank. 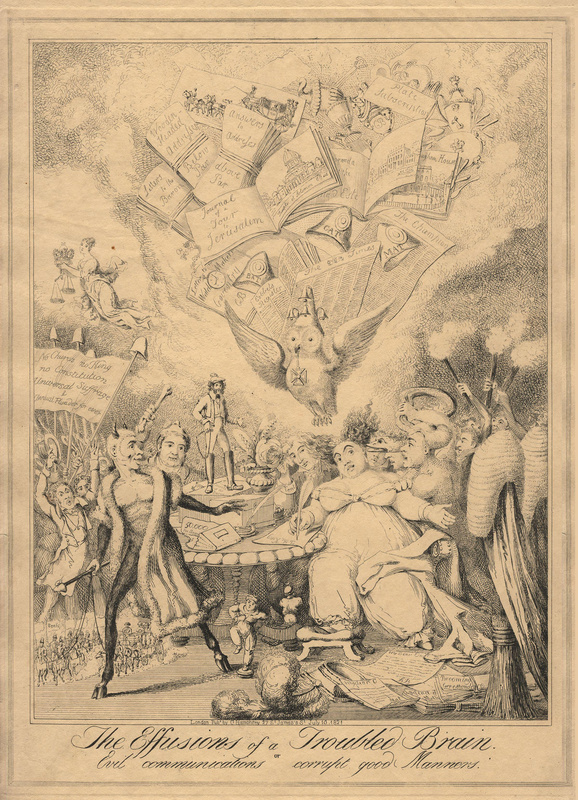 The book’s engraved frontispiece is arguably the most accomplished image Lane produced for the project and is also the only illustration to contain an overtly satirical element. 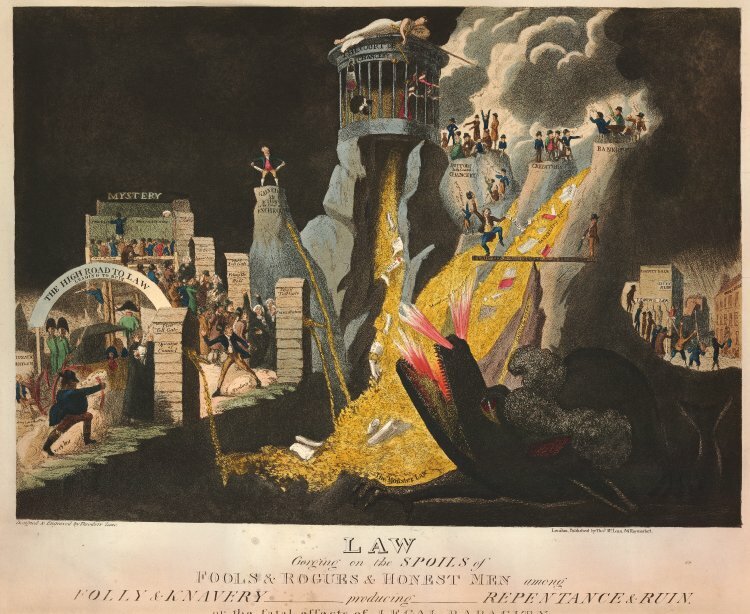 It depicts that actor’s career as a theatrical Pilgrim’s Progress through the sloughs of poverty, debt and louche living, towards the final apotheosis of a royal command performance and successfully fuses elements of Blake, Martin and Gillray with classical baroque influences such as Jacob de Backer’s Last Judgement (1589). The success of Life of an Actor revitalised Lane’s career and from 1825 onwards he was able to secure commissions to produce humorous prints for a range of West End publishers, including Thomas McLean, Knight & Lacey and George Hunt. His work in this period chiefly reflects his own personal interests and theatrical and sporting subjects are prominent amongst the surviving examples of Lane’s later prints. Many of the situations or individuals depicted in these designs were drawn from life, as Theodore’s newfound prosperity allowed him to pursue an active social life that included regular visits to the theatre, membership of a harmony singing troupe which performed at the Kean’s Head tavern in Drury Lane and the maintenance of a large circle of friends who typically congregated at the Wrekin Inn in Broad Court, Long Acre. 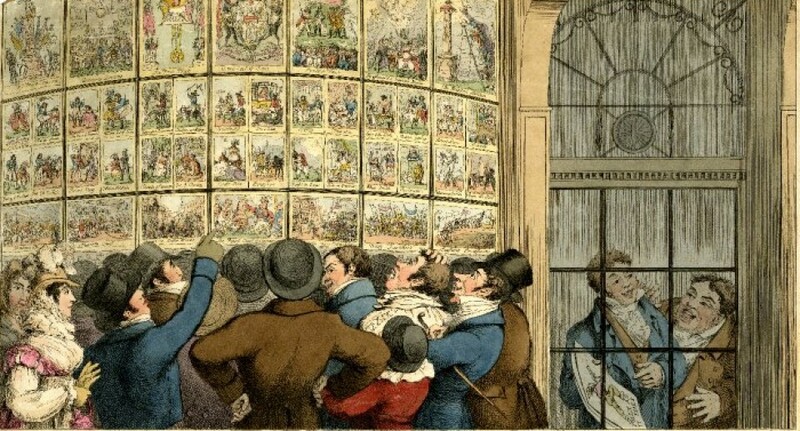 Prints such as The celebrated dog Billy killing 100 rats at the Westminster Pit (1825) and Masquerade, Argyll Rooms (1826) stand as a testament to the artist’s love of the often dubious pleasures of London’s nightlife. Law gorging on the spoils of fools & rogues & honest men among folly & knavery producing repentence & ruin. Or the fatal effects of legal rapacity, Aquatint, c.1827. Success brought with it a degree of financial security and this offered Lane the opportunity to devote more time to his painting. 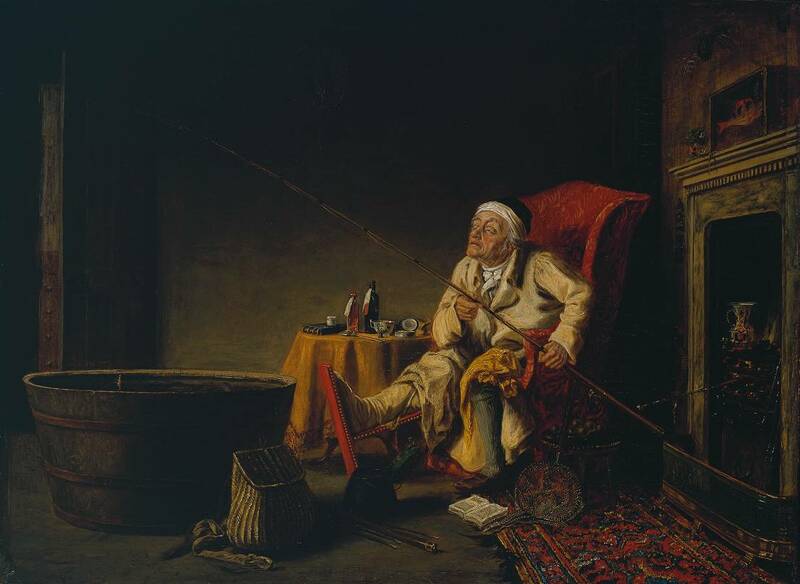 He is said to have approached the Scottish artist Alexander George Fraser in 1825 to ask for lessons in oil painting and within a year was turning out new works in oils that were deemed worth of public exhibition. In 1827 he sent one oil, The Christmas Present, to the Royal Academy and displayed another, the sentimental An Hour Before the Duel, at the British Institution in Pall Mall. Spurred on by the positive response these early works received, he put forward three major works for exhibition the following year; Disturbed by the Nightmare, Reading the Fifth Act of the Manuscript and The Enthusiast (right), which was described by one observer writing for the newspaper John Bull as being “a perfect gem amongst the trash and rubbish of the Suffolk Street Gallery”. Had Lane lived then it seems likely that he was destined to continue moving away from the world of print to pursue his artistic ambitions. On the morning of 28th June 1828, Theodore Lane left his his home at 28 Judd Street in Bloomsbury and prepared to join his wife, two young children and members of their extended family for a day in the countryside around Hampstead. Lane’s brother-in-law, the surgeon Henry Wakefield, had called in his gig to collect Theodore and the plan was for the two men to then drive on to Hampstead together. However, Wakefield wanted to take a small detour before they left town and call in to see a patient of his who lived in a house close to the Lane’s on nearby Manchester Street. On arriving at the house, Theodore announced that he would wait for his brother in the Royal London Bazaar, an impressive two-storey, neo-classical, building located a couple of minutes walk away. It seems that after they parted, Lane entered the Bazaar and climbed up to the first floor gallery which overlooked the large enclosed courtyard which was normally used to stage auctions of equestrian stock. He took out his pencil and a notebook and began to sketch the building but then, somehow, tripped and fell thirteen feet over the edge of the first floor balcony, landing head-first on the stone flagging below. He died instantly. Hitting the floor with such force that “the back part of his head was smashed to atoms, and his brains flew about in all directions”. The extent of his injuries were such that Wakefield, who arrived at the Bazaar moments after the incident occurred, did not recognise his brother-in-law until a business card was produced from the pocket of the corpse. Our readers cannot have forgotten the dreadful calamity which occurred a few days ago to a young artist of great promise, of the name of LANE, who fell through a skylight and was killed on the spot. He has left a widow and two small children in very poor circumstances. The genuine merit of the artist, and the destitute condition of his bereaved family, have excited more than common interest; and an English feeling is not accustomed to evaporate in mere language. A plan for a subscription has been suggested by some benevolent gentlemen who have no knowledge of the unfortunate deceased, except through his professional works. While many of Theodore Lane’s contemporaries clearly felt that his paintings would be his most enduring legacy to the art world, it is in fact through his works as a caricaturist that he is chiefly remembered today. The plates Lane produced during his time with George Humphrey are among some of the finest copperplate engravings published during the Queen Caroline affair and constitute an impressive final-flourish for a genre that was on the cusp of being irrevocably altered by market forces and the introduction of new technology. How many drawings and watercolours did Thomas Rowlandson produce in his lifetime? Lots. In fact, it was probably lots and lots. Joseph Grego was able to fill two substantial volumes with his attempt at cataloguing Rowlandson’s work and if the frequency with which previously unknown items continue to turn up at auction is anything to by, his efforts were still far from comprehensive. I think it would be a shame if these items were simply to disappear back into another private collection for thirty or forty years and so whenever I come across anything that I think is worth sharing, I will always endeavour to ensure that it gets a mention here in The Print Shop Window. This unsigned, undated, watercolour may have been a preparatory drawing for a planned engraving, although I must admit that I haven’t been able to locate a printed edition of the image anywhere online. It’s entitled The Duenna Outwitted and its theme of young lovers outsmarting an elderly authority figure is a constantly recurring one in Rowlandson’s oeuvre. 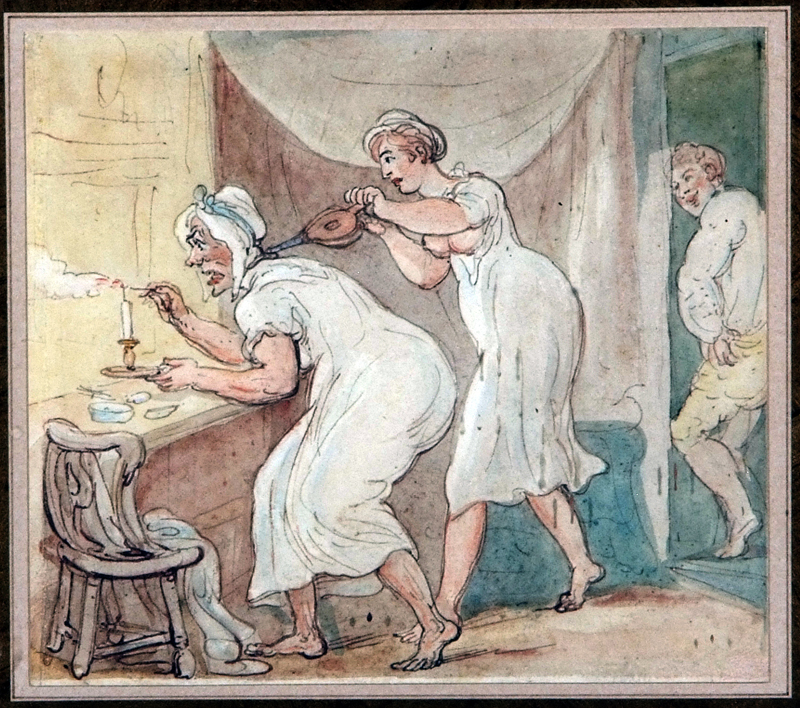 Here we see that the quick-thinking young woman has snatched up a set of bellows and is using them to extinguish the candle that would allow her hag-like governess to uncover the presence of a young man in the next room. Why she had a set of bellows in the bedroom in the first place is possibly something that’s best left to the imagination. C.J. Grant, The Political Drama No. 118. 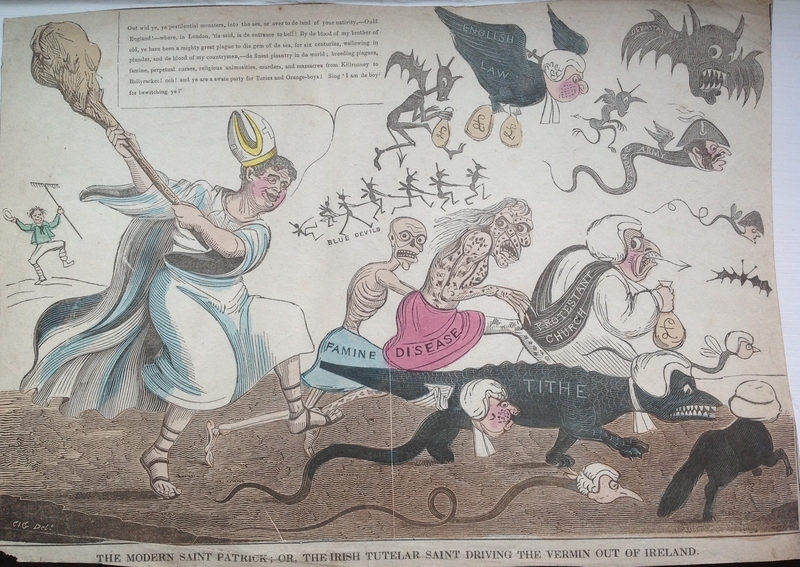 The modern Saint Patrick; or, the Irish titular saint driving the vermin out of Ireland, c. 1835-6. Regular readers will know that The Print Shop Window has always had a bit of a soft spot for the work of the English caricaturist C.J. Grant. Grant started out working as an assistant to Henry Heath during the late 1820s but by 1830 had struck out on his own and become a prolific and inventive engraver of lithographic and woodblock satirical prints. His work can often by characterised by its primitive engraving style and a dark humour based around the violent, supernatural and grotesque imagery. Today Grant is probably chiefly remembered as the creator of the sprawling Political Drama series; a set of 131 woodblock-engraved political prints that offers a reflection upon the hardships and justifiable sense of political grievance felt by those who eked out their lives on the bottom rungs of society in late Georgian England. This print is an exceptionally rare example from that series, as it comes from one of a tiny handful of editions of The Political Drama that were produced in colour by the publisher George Drake. It was formerly the property of the renowned art historian and print collector Francis Klingender and came to me via a private dealer who purchased part of Klingender’s collection at auction several years ago. It serves to remind us of the strong links that existed between English radicals and Irish nationalists in the early nineteenth century and also of the influence of the Irish diaspora on the lower-end of the market for printed satire in England during this period. The memoirs of the gossipy socialite Henry Angelo contain a wonderful anecdote about this print. This kind of language would have been considered grossly inappropriate at the best of times but in early 1798, with the nation dogged by fears of a potential fifth column of Jacobins plotting revolution in England and Ireland, it was considered to be an outright act of sedition and supreme class-treachery. Within days of the first accounts of the dinner appearing the London press, Norfolk had been summoned to St James’s Palace, unceremoniously stripped of the office of Lord Lieutenant of the West Riding and ordered to immediately resign his commission as a Colonel in the 1st West Yorkshire Militia. 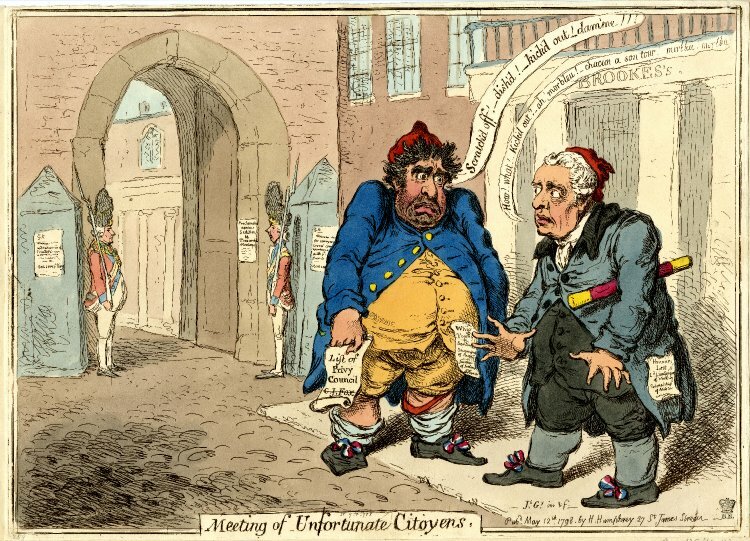 Naturally, the affair aroused a great deal of public interest and London’s caricaturists were quick to try and capitalise on this by producing a range of new satires that made light of Norfolk’s downfall. The demand for these prints was such that even publishers who were normally supportive of the Whigs began to cast aside their political loyalties in order to turn a good profit. 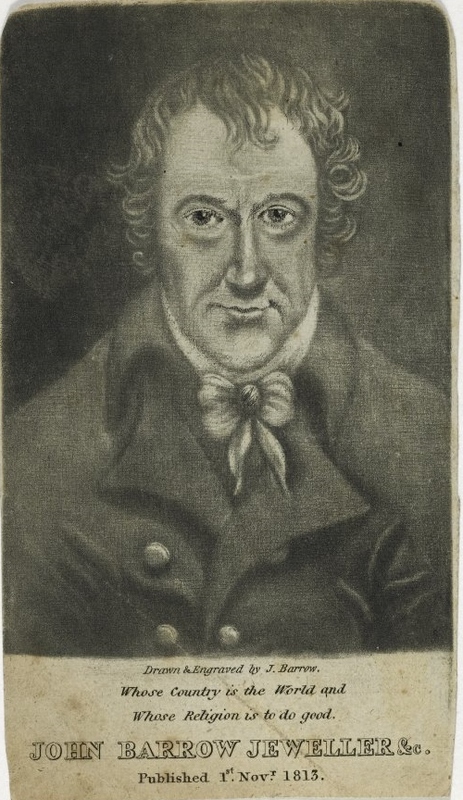 The printseller William Holland was known to be sympathetic to the reformist cause and had even been imprisoned in 1794 for selling copies of Tom Paine’s The Rights of Man. More importantly, he also counted the Duke of Norfolk amongst his most loyal customers and was said to regularly send portfolios of newly published caricatures, carefully screened to avoid anything too critical of the Whigs, up to Norfolk’s London residence for the duke’s consideration. However, when an unidentified publisher offered Holland the chance to purchase copies of Drumming out of the Regiment!! he immediately “subscribed for half a hundred copies, shrewdly foreseeing that the print would have a rapid sale.” The prints arrived a few days later but as the publisher’s deliveryman deposited the bundled of freshly printed caricatures on Holland’s counter, the Duke of Norfolk himself strode through the shop door. When the duke entered, [he] address[ed] the printseller with, ” Well, Holland, what have you got there, hey? Anything new?” “Had it been the devil,” said Holland… ” like St. Dunstan, I might have taken him by the nose; but I stood dumb-founded in the presence of the earl marshal of all England — first peer in the land!” Having his wits about him, however, he rapidly rolled up the parcel, saying, “My Lord Duke, they are – mere – old articles.” Unfortunately for Holland the duke was not to be thus fobbed off; so, with a civil sort of force, the earl marshal of England laid his powerful hand upon the prints, and, drawing one forth, cast his proud eye upon it, and, pressing his firm lips together, he ejaculated, “So, Mr. Holland!” When, deliberately rolling-it up, he put it into his capacious pocket, and turned his back upon his astounded merchant and protégé for ever. It’s easy to see why the duke was unhappy. The print shows a dejected Norfolk being frogmarched out of St James’s Palace in disgrace. He is escorted by Dundas, Pitt and Windham, who are all dressed as soldiers of the regiment that Norfolk had until recently commanded. Their efforts are being encouraged by the King, who leans out of a window on the right and says “Drum away, Billy!! I wish they were all drummd out! !” A sign pinned to the Norfolk’s back reads: “Washington, 2000 Men, make the application, Champion of Liberty, Sovereign, Majesty [of the] People & &.” In the distance we can see Charles James Fox and Richard Brinsley Sheridan weeping at the sight of their colleagues humiliation. …good humouredly addressed Mrs. Humphreys with, “Well, my good lady, I perceive you have something new in your window;” and, pointing to the very print, paid his eighteen pence for it, received his change out of half a crown, rolled it carefully up, and, putting it in his pocket also, smiled a “good morning to you” and gently shut the shop door on his departure. This was why, Angelo concludes, “everybody loved Mr Fox”.